What is it that makes a great author? I feel certain all wanna-be authors have wanted to know the answer to that. To me a great author is one who manages to reach her audience in a manner that lets the reader remember her. S.M. Reine is one such author. Another important quality that Reine handles well is keeping the flow going. 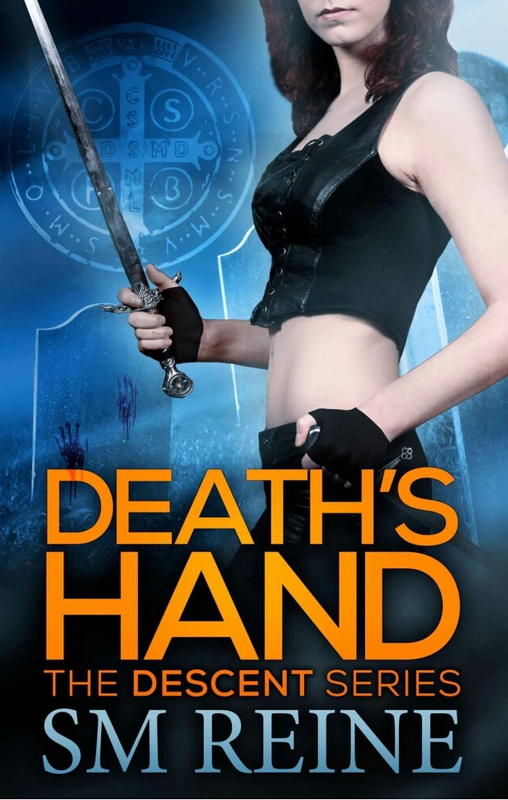 Death’s Hand shows Reine’s skill at drawing the reader into the world of Elise Kavanagh and James Faulkner almost immediately. Remaining in the world of Elise, the kopis, and James, the aspis, was no effort at all. I am always gratified when an author manages to do that to me. Our introduction to Elise and James is when James finds Elise surrounded by 12 female corpses on a plain in Russia. She is barely alive and even unconscious. We then jump briefly to a time ten years before that when Elise is handed her first kill by her father. Yes, I agree – perhaps you ought to be more than seven years old before you kill your first demon. After that we jump to the present (11 years after James found Elise) and meet an Elise and James who are both in retirement from the killing business. Business is the wrong word to use for what the pair did. Elise is a kopis or sword while James is an aspis or shield. Their job used to be to make certain angels and demons kept humans from knowing about the supernatural world. Sometimes they had to kill to make that happen and the pair were always on the run just to keep alive. So, retirement makes sense and Elise has to use a pseudonym so she will not tip her clients off as to her identity. Throughout Death’s Hand we go back and forth in time and we get glimpses of how Elise and James have ended up where they have and why Elise feels such a need for a semi-normal life. But the past has a tendency of catching up with us one way or another. Elise and James are no exception to that rule. Elise is the kind of heroine that I enjoy reading about. Her strength is amazing and based on the scars of her past. Her past has left her highly vulnerable and one way to deal with that is to skunk the people who come into her life. All except for her room-mate Betty. Betty is the one thing in Elise’s life that Elise loves unconditionally. For some reason Betty has been the armor-piercing bullet that needed to get past Elise’s defences and keep her somewhat grounded. We all need friends like that. James, on the other hand, seems to dislike and fear Elise at the same time as he feels the need to protect her. Granted, Elise is a force to fear, but then so is James Faulkner, the witch. Indeed, a very powerful witch at that. Hmmm?